You may know that the large, colorful, rounded sails often seen on racing boats while they are sailing downwind are called spinnakers, but few know where the name comes from. One story says the word is derived from the name of the first yacht to use such a sail, the "Sphinx". The sail was so much larger than any other sail previously seen that it became known as "Sphinx's acre"; hence the term spinnacre or spinnaker. Because of the sail's rounded shape and colorful material, most sails see a resemblance to a parachute and therefore often call it the "chute". In Australia, it is often referred to as the "kite" because of the way it flies out in front of the boat. Modern spinnakers are usually constructed of lightweight nylon ripstop material weighing between 1/2 ounce and 3.0 ounces per square yard. Most of our spinnakers are constructed of 3/4 ounce cloth, although some of our cruising chutes are of stronger 1-1/2 ounce cloth. Spinnaker cloth is easily torn by sharp objects, such as exposed cotter pins or sharp edges. This is why all such items should be taped over with gray duct tape. Although some older spinnakers are of crosscut construction, most modern chutes use the radial or tri-radial construction (see Figure 8). Because the spinnaker is only attached to the boat at three corners, all the stress radiates into the sail at these points. With a tri-radial, the stress is along the seams instead of across them, making a stronger sail and minimizing stretch and distortion. Radial head spinnakers are normally used for running because they are cut very full at the shoulders. Tri-radial spinnakers are better for reaching. They stretch less and are of a flatter cut. In order to set the spinnaker you must learn some new terms. First is the spinnaker pole. This is used to hold out the sail at the windward, lower corner (the side opposite the mainsail). The inboard end of the pole is clipped to the sliding ring on the forward edge of the mast. The pole is hoisted by pulling on the topping lift. The topping lift is attached to a ring that forms a bridle on the pole (see Figure 9). The foreguy pulls the pole downwards, preventing the pole from rising too high when the chute cateches a gust of wind. The spinnaker is hoisted by the Spinnaker halyard (the rope halyard). The head of the spinnaker is attached to the halyard. The Spinnaker sheets are connected to the two lower corners of the sail. The sheets are then led to the turning blocks near the stern of the boat. Since the spinnaker is symmetrical, whichever lower corner is attached to the spinnaker pole becomes the tack and the free flying corner becomes the clew. Likewise, the spinnaker sheet going to the end of the pole becomes the afterguy, while the free flying side remains the spinnaker sheet. See Figure 10 for the corn late picture of how this works. On our boats, the spinnaker sheets, foreguy, and the spinnaker itself are kept in the spinnaker dockbox. The pole is located under the deck on the starboard side of each boat. Before leaving the dock, the foreguy should be rigged through the fairlead just in front of the mast and led back to the cleat on the cockpit. The spinnaker sheets are led through the turning blocks on the port and starboard sides. The sheet end with the brummel hook spliced on it should be led outside of all other rigging and tied to the shrouds. If you plan on setting the chute while on starboard tack, both sheet ends should be secured on the port side. If you will be setting the chute on port tack, the sheets should be tied to the starboard side. The spinnaker pole should be on deck with one end clipped to the shroud and the spinnaker sheet clipped in the other end. Snug up the foreguy to hold the pole in place. The pole is rigged on the side opposite the spinnaker. Normally, the spinnaker gear is set up as in Figure 11 before leaving the dock. The turtle is hooked up just prior to setting. Assuming a starboard tack set, bring the turtle up on deck and secure it to the port shrouds and deck using the snaps or tie lines on the turtle. This is very important as the turtle will sink if dropped into the water. Next, hook up the halyard and sheets to the three corners. Double check this step to make sure the sail will go up cleanly. Hooking the head to the sheet and the halyard to a clew and raising the sail sideways. Leading the halyard around or between the shrouds so that the sail is tangled in the shrouds. Leading the sheets around or between the shrouds. Remember that when the sail fills, it will be outside of everything else, therefore, the lines connecting it to the boat must also be led outside of everything. The next step is to raise the pole into position on the starboard side. First, release the foreguy which was holding the pole on the deck. Release the inboard end of the pole from the shroud, and clip it to the ring on the mast. Attach the topping lift and raise the pole until it is approximately horizontal. Snug up the foreguy. For your first few sets it will be easier to drop the jib first so that you are able to see what is going on. Later, you may leave the jib up until the spinnaker is flying for more boat speed. To set the chute, pull the cover off the turtle and pull the halyard up an the way as fast as you can. Then, pull the afterguy back until the sail reaches the pole, pulling the pole back away from the forestay until it is 90 degrees to the wind. Lastly, pull the spinnaker sheet in until the sail fills with wind. Once the pole trim is correct, sail trim is simply a matter of easing out the sheet until the weather luff of the spinnaker starts to curl or fold in. This is the farthest the sheet should be eased. Any more and the sail will collapse, requiring that you pull the sheet in again until it fills. But do not make the opposite mistake of failing to let the sheet out enough, otherwise the sail will not be as efficient as possible. If you wanted to, you could cleat the sheet off once you have achieved the correct trim, but this is not good practice because a change in course or wind could cause the sail to collapse. This suggests a final factor to keep in mind when using a spinnaker: The helmsman should try to steer a straight course. Any wandering off course will necessitate retrimming the pole and sheet. it is possible to execute an end-for-end jibe with only two crewmen, but a more comfortable minimum is three: one to steer the boat, one to trim the sails, and one to handle the pole. When you are about to jibe, the crew should get into position. The helmsman will handle the tiller and the mainsheet. The sheet trimmer will operate both the sheet and the guy, while the foredeck man will handle the pole. When the helmsman gives the order to jibe he should trim the mainsail in to the centerline and gently turn the boat to head downwind. As soon as the boat is heading downwind the foredeckman should first unhook the pole from the mast and then from the spinnaker. The pole is then passed through the foretriangle and hooked into the spinnaker sheet on the other side and then onto the mast. When this is done, the helmsman should let the mainsheet out and turn the boat onto the new course. During the entire jibe it is the job of the sheet trimmer to keep the spinnaker filled and pulling. It is safest to drop the spinnaker while sailing on a broad reach or downwind. This way the mainsail blocks the wind from the spinnaker, making it easy to collapse. 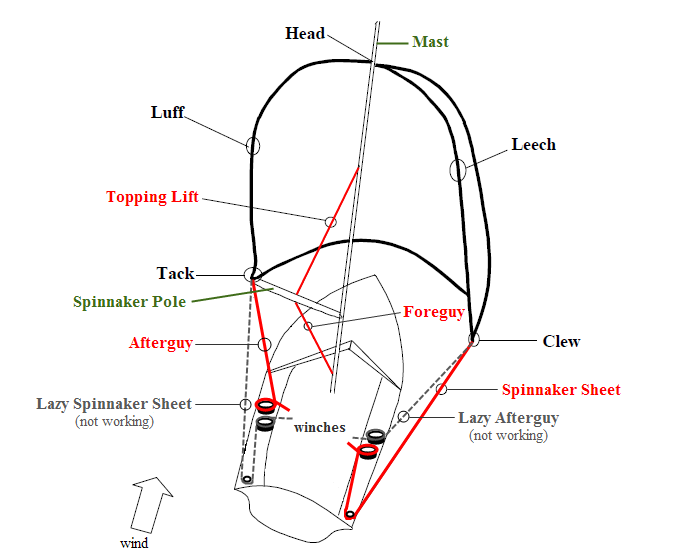 To drop the chute, the trimmer should cleat the spinnaker sheet, then reach up and grasp the part of the sheet that is flying in the air directly attached to the spinnaker. Next, the afterguy is released, allowing the chute to swing behind the mainsail where it will collapse. The trimmer should pull the sail to him with the spinnaker sheet and gather as much of the foot as possible. The spinnaker halyard can then be lowered as the trimmer (now the gatherer) pulls the sail under the boom into the boat. A common problem is letting the halyard down too fast, dropping the chute into the water. Once the sail is on board, lower the topping lift, remove and stow the pole and get everything cleaned up and led for the next set. For the first few times it may be easier to lower the spinnaker first and then raise the jib. Later, the jib can be set first before dropping the spinnaker. Although the spinnaker adds excitement and challenge to sailing, the smart skipper is keenly aware of the limits of his abilities, his crawls abilities and the parameters in which the chute can be safely flown. The spinnaker can only be effectively flown off the wind on at least a beam reach. The heavier the wind, the broader the reach must be to keep from overpowering the boat. At some point of increasing wind on any boat, flying the chute at all will cause the boat to go out of control. A smart seaman knows when not to tempt fate. In the ocean, the swells can have a significant impact on your control, so be careful. Keep in mind that with the spinnaker up you sacrifice some maneuverability. Even with a trained crew, it will take longer to change course, or jibe with the spinnaker than without it. This is especially important in the bay. Always plan ahead when there is traffic. Take the chute down if you need to. Especially in the summer months on weekends, there may simply be too many boats to fly a spinnaker safely. With all of the things going on while sailing with the spinnaker, it is easy for the helmsman to become distracted from his job. Remember, the skipper's first job is to steer, so as to avoid a collision. Remember to anticipate the unexpected. Flying the spinnaker adds a dimension of increased complexity, and thus the possibility of mistakes increases. Who will steer while you get the wrap out of the chute? How will you turn around if the spinnaker halyard jams? The spinnaker is typically a downwind sail. But let's say you needed to go upwind and didn't want to douse it. What should you do if you need to go substantially upwind with the spinnaker still out. Tighten the crap out of the topping lift to get the spinnaker pole pointing high up into the air. Its okay if it rests against the forestay a bit. If the spinnaker looks bizarre because it is pointing up at the sky, that good - that means you did it right. It took me forever to understand why, but since the spinnaker has this bizzare "cupping" shape to it, the raising of the spinnaker pole and the tightening of the spinnaker sheet gets the sail as shaped as close to a genoa as possible.